Corrugated Iron was invented in the 1820s in Britain by Henry Robinson Palmer, architect and engineer to the London Dock Company. It was originally made (as the name suggests) from wrought iron. It proved to be light, strong, corrosion-resistant, and easily transported, and particularly lent itself to prefabricated structures and improvisation by semi-skilled workers. It soon became a common construction material in rural areas in the United States, Chile, New Zealand and Australia and later India, and in Australia and Chile also became (and remains) a common roofing material even in urban areas. In some less wealthy areas around the world corrugated iron is a major building material allowing the construction of shanty towns and slums. For roofing purposes, the sheets are laid somewhat like tiles, with a lateral overlap of one and half corrugations, and a vertical overlap of about 150 millimetres (5.9 in), to provide for waterproofing. Corrugated Iron is also a common construction material for industrial buildings throughout the world. 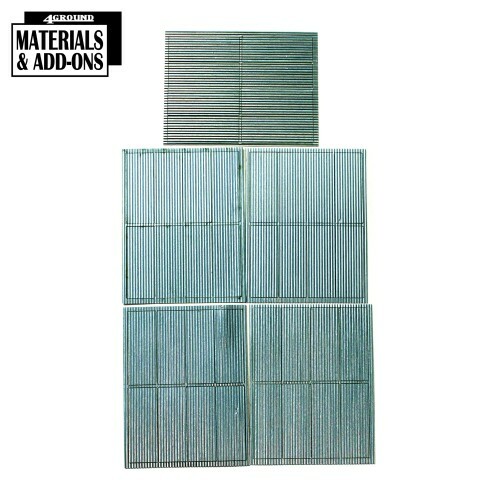 This kit includes 40 pre-painted, plastic sheets of corrugated iron, cut on 5 sprues to be in scale for 28mm figures.